The morning after was sunny and blurry, but he had a cure—something he called, “The Cocktail.” I have to preface this by saying that I in no way advocate the use of alcohol. Alcohol, pure and simple, is a poison. A small glass of wine is medicinal. Anything more is technically abuse. Still, we are a nation of imbibers in a world of imbibers, and so long as we take care of ourselves in between, we can probably survive the occasional St. Patrick’s Day binge—minus a few million brain cells. The only real cure for a hangover is time, but it can help to hydrate and feed yourself. Caffeine, as you likely have heard, should be avoided until you are fully hydrated, since all it does is to dehydrate the body further. Alcohol also depletes your glycogen stores, which is your back-up fuel, so getting calories in your body is important. Orange juice is fast fuel. Protein and fat help to replenish glycogen. Hair of the dog—in other words—drinking again the morning after, only prolongs the situation and, over the long term, makes things worse. Exercise also helps, by the way, and milk thistle is important as a liver nurturer. If you do drink regularly, take a little milk thistle tincture or a capsule every now and again. Dandelion and burdock are also helpful. Unfortunately, nothing can replace those lost brain cells. Consume all at once. 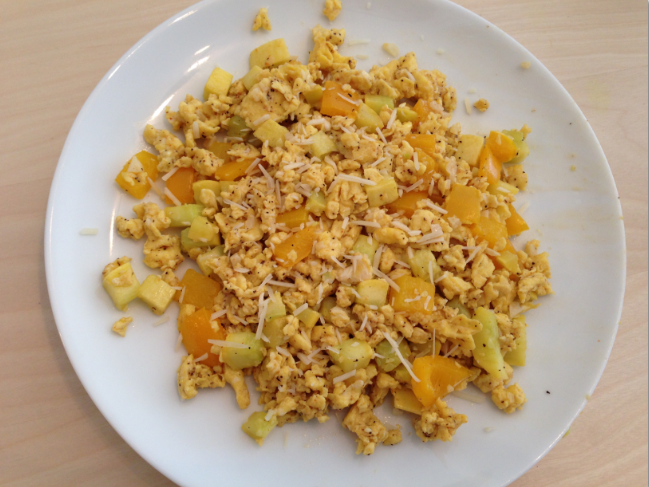 Follow with a high-protein meal such as Phil’s Mellow Yellow Scramble. Melt butter in skillet. Beat eggs with milk and pour into skillet. Add vegetables and garlic and cook until eggs are no longer runny. Stir in cheeses. Sprinkle with seasonings and continue tossing and stirring until eggs are cooked through. Vegetables will still be slightly firm. Add more seasoning to taste. Top with another sprinkle of Parmesan just before serving. A few notes on this recipe: Cinnamon-­‐‑walnut toast makes Phil’s breakfast a meal to remember. And Oregon’ʹs Tillamook Cheese is a more affordable choice than organic. It is pure cheese, and they have built a reputation on only using milk from non-­pharmaceutical cows. Lastly, once you get started using Tony Chachere’s Original Creole Seasoning, you’ʹll be tempted to use it on everything.